Star Wars Battlefront II is going to receive a brand new update, named Battle of Geonosis update, next week, and the update is also going to finally introduce a fan-favorite character. From November 28th, Star Wars Battlefront II players will finally be able to play as Obi-Wan Kenobi. The characters will be a more defensive one, staying true to his traits. 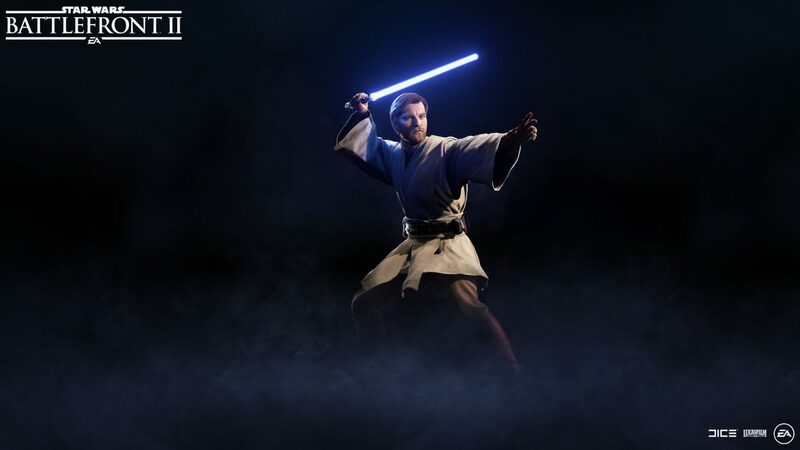 Wielding his trademark lightsaber beaming with blue, and reflecting his mastery of defensive combat, Obi-Wan’s blocking skills are superior to any other Jedi in the game. His stamina and near perfect defense are joined by powerful, chained melee attacks. Our intention is to make him feel like the general we follow throughout the Clone Wars, where he commanded the 212th Attack Battalion – also coming to the game as Appearances for the Galactic Republic with the Battle of Geonosis update. This is most markedly referenced through his Defensive Rush Ability, where Obi-Wan rushes forward while swinging his lightsaber, deflecting blaster shots with flawless accuracy and damaging enemies in front of him. When this Ability is active, the player can choose to deliver a final strike at anytime. Messing with an opponent’s heads is a bit of a specialty of Obi-Wan’s, and this is showcased with the Restrictive Mind Trick Ability. The mind trick disrupts the target’s Abilities for a short time – including dodges! Use it wisely to outsmart your enemy. Offensively, he can utilize the Force to make an All-Out Push. It’s similar to Luke Skywalker’s push, but Obi-Wan’s version is more focused than that of his future pupil. We’re giving additional control to the player, as holding down the button increases the range of this Ability. To sum things up, Obi-Wan Kenobi is composed, defensive, and a true master of the Force. Obi-Wan Kenobi will come with the default Jedi Master Appearance. The Robed Appearance will be available for purchase, with the General Kenobi Appearance launching at a later time. Star Wars Battlefront II is now available in all regions on PC, PlayStation 4 and Xbox One. The Battle for Geonosis update launches on November 28th.